The incredible value of a Herman Miller Ethospace workstation continues to grow as time passes. Its structure and interchangeable tiles ensure that your office look will remain modern. You need the flexibility and durability that an Ethospace system gives you to ensure you meet the demands of an ever-changing business world. 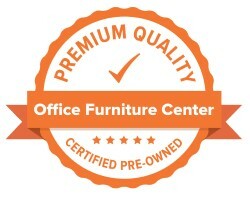 Take a look here at how Office Furniture Center has custom designed Herman Miller Ethospace workstations for clients in the past! 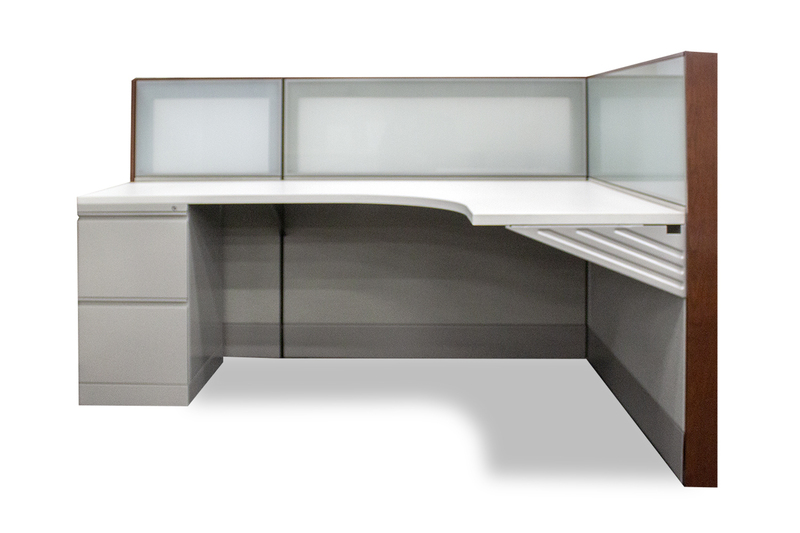 Pre-owned Herman Miller Ethospace workstation, size: 8'D x 8'W x 62”H. Panels consist of metal frames and fabric tiles. Fabric tiles are Glasscloth/Pampas (2I02). Architectural trim is wood veneer, color Medium Brown (EG). Workstation features 48"W translucent (aka frosted) glass tiles along the wings and aisles in top position. Storage consists of (1) Geiger 24"D x 24'W x 46"H wardrobe/bookcase/FF unit, composition wood veneer, color Medium Brown (EG); (1) surface supporting File/File (FF) pedestal, color Champagne Metallic. Station also includes (1) 48"W overhead bin with wood veneer door front, color Medium Brown (EG) and metal shelf pan and sides, color Champagne Metallic. Work surfaces are laminate consisting of (1) 30”D x 48”W x 24"D x 96"W extended curved corner and (1) 30”D x 48”W x 24"D x 72"W extended curved corner, color Soft White. National Electric Code (NEC) power components are included along the base of spine panels, two (2) duplex receptacles per workstation. Power infeed to connect to the building source power provided at additional charge (Note: This workstation requires a licensed Electrician to connect to building power supply). No data/IT components are provided. Ancillary components include mobile box/file (BF) with cushion pedestal, monitor arm(s), pencil drawer and keyboard tray - ask your rep for availability and pricing.